At Riverside Dodge Chrysler Jeep, we have a goal to keep our Prince Albert consumers updated about the features that come with our models. If you want a light-duty pickup truck, the Ram 1500 is an exceptional model with an abundance of capability features that enhance efficiency. 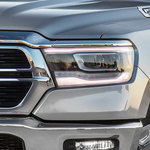 The Ram 1500 comes with the available class-exclusive Active-Level Four Corner Air Suspension System. This suspension system will automatically lower when the truck is moving at highway speeds to provide you with improved efficiency and reduced drag. The standard engine that is equipped with the 1500 is the 3.6L Pentastar V6 engine with eTorque. This engine can reach 305 horsepower and 269 lb.-ft. of torque, and you can tow up to 3,506 kg with this engine. The available engine offered with the 1500 is the 5.7L HEMI V8 engine that can reach 395 horsepower and 410 lb.-ft. of torque and can tow 5,266 kg. The 5.7L HEMI V8 engine with eTorque can deliver best-in-class towing capability of 5,783 kg.